We’d be lying if we said we weren’t seriously addicted to cookies. Gooey chocolate chip, sweet white chocolate or yummy peanut butter, we’re not fussy! So, when we found out that a cookie could be combined with the glory of fries, and dipped in all sorts of sugary goodness, there was no stopping us from finding out how and where to get our hands on an endless supply. 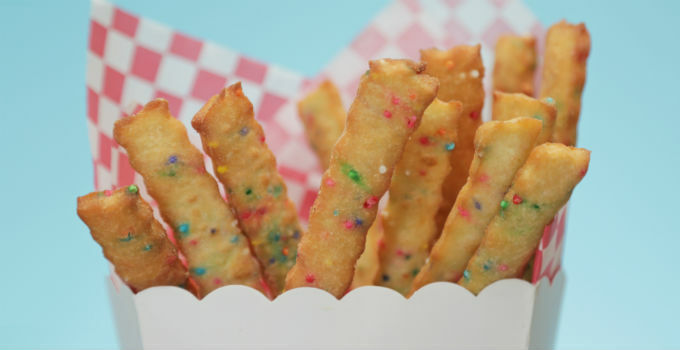 Of course, the only way to guarantee no imbalance in the supply and demand of our cookie fries supply chain is to make them ourselves! Preheat oven to 180C and line a baking sheet with parchment paper. In a bowl, mix together flours and salt until incorporated. Use a fork to cut the butter into the mixture, like you would a shortbread cookie until it’s mixed in. In a second bowl, whisk together eggs and icing sugar until light and fluffy. Add the vanilla extract and continue mixing until incorporated. Slowly mix in the flour mixture until a sticky dough forms. Add sprinkles and continue mixing. Roll the dough out and use a crinkle cutter to cut French fries out of the dough. Place cookies on the baking sheet and bake for 5 minutes. Remove from the oven and let sit for 3 minutes to cool slightly. Meanwhile, heat oil in a heavy-bottomed pan to 180C. Fry cookies until the outside is just turning golden brown. Remove from the oil and let drain on a paper-towel-lined plate. And remember: double dipping doesn’t count if nobody’s looking. Recipe adapted from Popsugar.